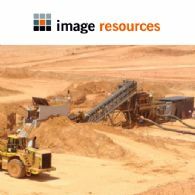 Image Resources NL (ASX:IMA) is an emerging Mineral Sands producer focused on the development of its high-grade Boonanarring Project in the North Perth Basin while continuing to expand its resources and reserves base. 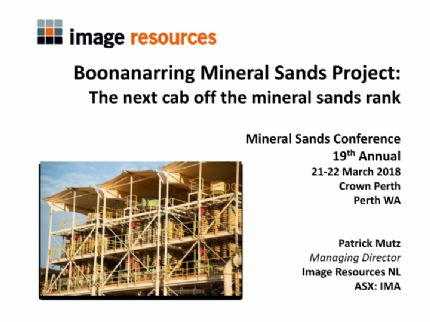 Image Resources NL (ASX:IMA) (OTCMKTS:IMREF) provides the Company&apos;s latest presentation at Mineral Sands Conference. 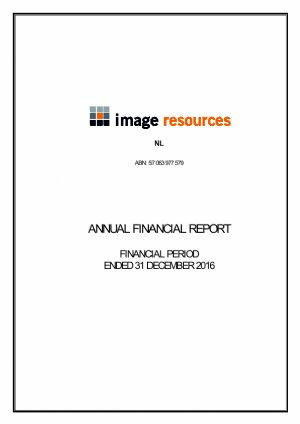 Image Resources NL (ASX:IMA) (OTCMKTS:IMREF) is pleased to announce its Equity Raising has closed fully subscribed. The AU$25m Equity Raising was launched on 11 March 2018 with Euroz Securities Limited, the Sole Lead Manager and Sole Bookrunner. Demand has come from new and existing investors. 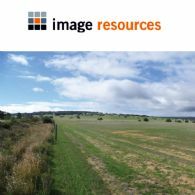 Image Resources NL (ASX:IMA) (OTCMKTS:IMREF) is pleased to announce it has entered into two Equity Subscription Deeds to fully underwrite the issue of 250 million fully paid ordinary Image shares at an issue price of 10 cents to raise AU$25M (before costs). 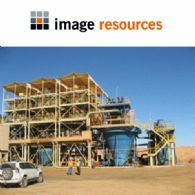 Image Resources NL (ASX:IMA) (OTCMKTS:IMREF) is pleased to announce that the Company has entered into a Loan Note Subscription Agreement with Pala Investments Limited and Castlelake IV, L.P. and CL V Investment Solutions LLC which are entities controlled by Castlelake L.P. as the Loan Note Holders, to raise AU$50M1 from the issue of senior secured loan notes. Image Resources NL (ASX:IMA) (OTCMKTS:IMREF) is pleased to advise the Company is finalising the issue of a contract to BMD Constructions for the construction of the site entry road intersection for its 100%-owned, high-grade, zircon-rich Boonanarring Mineral Sands Project located in the infrastructure-rich North Perth Basin, located 80km north of Perth, Western Australia. 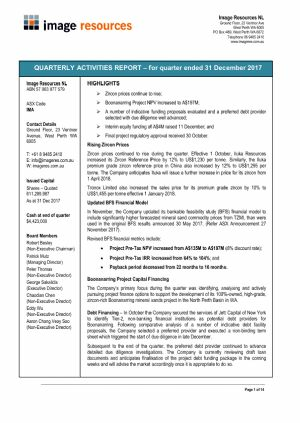 Image Resources NL (ASX:IMA) provides the Company&apos;s Quarterly Activities Report for the quarter ended 31 December, 2017. 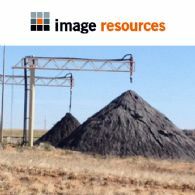 Image Resources NL (ASX:IMA) is pleased to announce a placement of 40,000,000 new ordinary shares at an issue price of 10 cents per share to qualified institutional and sophisticated investors to raise $4,000,000 (before costs). Image Resources NL (ASX:IMA) (OTCMKTS:IMREF) is pleased to announce updated Bankable Feasibility Study results for its 100%-owned, high-grade Boonanarring and Atlas mineral sands deposits located in the infrastructure-rich North Perth Basin, with Boonanarring approximately 80km north of Perth, Western Australia. 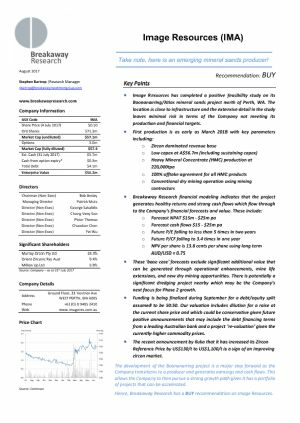 Image Resources NL (ASX:IMA) (OTCMKTS:IMREF) is pleased to announce Image has received the final approval required for the construction and commissioning of its 100%-owned Boonanarring Minerals Sand Project located approximately 80 km north of Perth in the North Perth Basin. 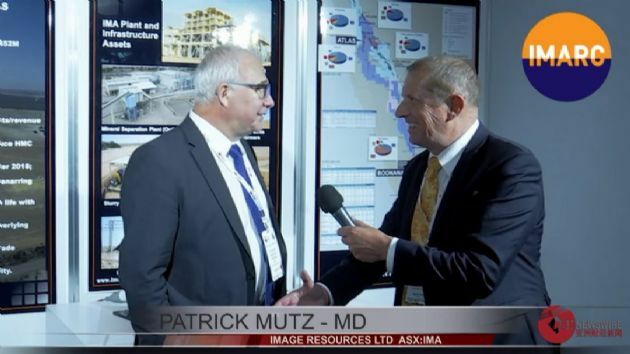 Image Resources (ASX:IMA) ABN Newswire interviews Managing Director Patrick Mutz at the International Mining and Resources Conference (IMARC) in Melbourne, Australia.